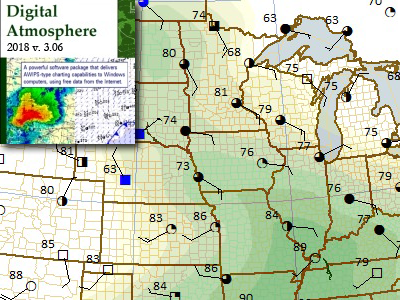 Digital Atmosphere is a full-featured Windows software package that allows you to plot detailed surface and upper air maps, soundings, and radar charts anywhere in the world. 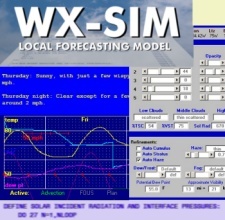 This software program has been under development since 1992 and is used by hundreds of hobbyists, companies, and weather agencies. See it in action at: AustralianWeatherNews, MeteoCenter Russia, and Weather Roanoke. Since it can construct ultra-high resolution weather maps, it is used for graphics content in Weatherwise and IFR Magazine magazines. There's no risk getting the Standard Version, as it is upgradable at any time to the Professional Version for the difference in price. Our popular forecast storm chase simulation was rewritten and updated in late 2014 and offers a choice of either chase simulator mode or single-point forecasting, with extensive verification metrics. This package lets you try your hand at forecasting on hundreds of spring days spanning 2010 to 2014 -- including big outbreaks, ordinary scenarios, and null events. You never quite know what you'll get! Start out perusing the morning charts. You get 140 of them each day, including SPC diagnostics and even SPC outlooks if you want to peek. After you looked at the charts, you need to pick a starting point for your chasemobile. Then start it on its way towards the target! As severe weather unfolds, you'll see text reports stream in from locations close to your chasemobile. A karma rating keeps track of how well or disappointing your chase is doing, comparing your own success and what's going on just over the horizon. A thorough set of SPC summaries tracks how you're doing. Do you have what it takes to get storm chasers to the target? This educational forecasting simulation draws from 250 major chase days between 1979 and 2009, presenting users with the morning analysis charts and high-resolution hourly satellite images. Page forward hour by hour and refine the forecast, then once storms develop, compare how well you did with the locations of actual tornadoes, hail, and wind. We recommend the Standard version for most users. For those who would like to upgrade later, the Professional version is available for the difference in price. 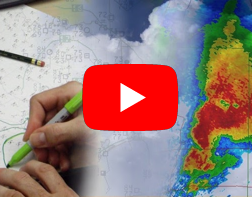 We are the sole publisher of the Forecaster's Handbook Series, written by Tim Vasquez, an actual operational forecaster with 10 years in Air Force weather and 15 years in private practice. 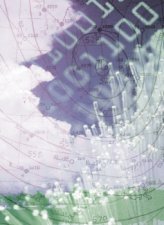 These are not school textbooks or scholarly works -- they are guidebooks and references for practicing meteorologists and are perfect for not only professionals but hobbyists, broadcast meteorologists, storm chasers, pilots, flight dispatchers, and anyone who deals with forecasting on a regular basis. The technical level spans the entire range of intermediate to advanced in an easy-to-understand format. Excessive introductory content and complicated math are omitted, and the concepts and examples focus squarely on actual forecast considerations, real life cases, and those rare bits of wisdom that make or break a forecast. 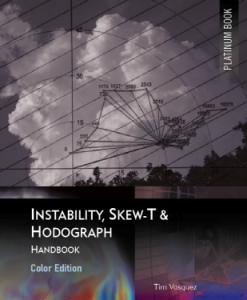 And for university students, the experience distilled in these books contains valuable insight into the forecast process that simply isn't conveyed by courses filled with emphasis on dynamics and physics. When you want to look at past weather situations, our Archives Datasets give you tremendous amounts of historical information. 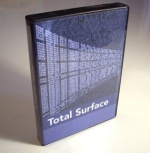 Global Surface Archives is a massive 60 GB package of METAR and SYNOP data for the entire world, spanning 1930 to 2014, and is plottable by Digital Atmosphere or any program capable of handling METAR or SYNOP format. Original METAR remarks transmitted by the observer go back to 1973! Global Upper Archives offers upper air data for the world spanning 1930 to 2014. This, too, is in a standard coded format (WMO TEMP) and is plottable by Digital Atmosphere, RAOB, SHARP, and many other programs. Total NCEP gives key NCEP charts going back to 1998 which constitute the official surface and upper-air analyses, twice a day, for North America. Total NWS is packed with forecast discussions, warnings, watches, zone forecasts, and much more going back 10 years into the past; an excellent keepsake for hobbyists, researchers, and investigators. For analysts, industry researchers, and researchers who want it all, ARGON is a ultra-massive database containing over 100 GB of weather data in MySQL database format. It's all contained on an expandable 250 GB USB hard drive. There is complete observation coverage for North America from federal weather observation sites, with data content spanning January 1931 to November 2009. With the power of SQL, you have unprecedented capability to analyze statistics and weather records. You can export data to spreadsheets, compute averages, develop climate algorithms, and much more! Optional updates are available in the form of DVD patches sent twice a year. Need weather data in a hurry? Do you not need the full DVD archive sets? Order data by the day for quick download! Our holdings include SYNOP, METAR, Upper Air, satellite, and DIFAX charts going back many years. All files are provided hour by hour for easy plotting. Tim Vasquez offers personalized training sessions via Skype, Discord, or phone and private video stream. This allows students to get all the benefits of the 100+ Forecast School courses we have done, and allows you to ask questions, show charts, and go over products. 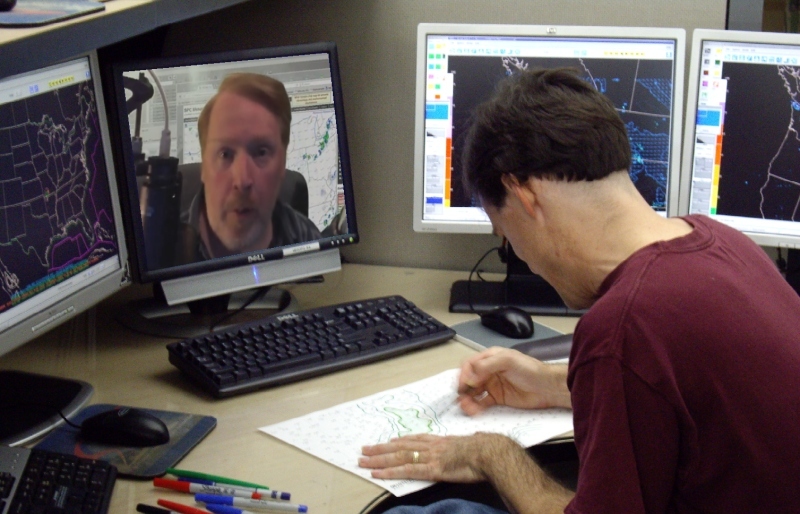 Weather Graphics Technologies offers the superlative forecasting talent of owner Tim Vasquez for hire. Tim draws from 9 years of Air Force weather forecasting experience, 2 years of media forecasting experience (with KTXS-12 in Abilene and AFRTS in Korea), and 16 years of active storm chasing experience. Tim is also a columnist for Weatherwise and IFR magazine. 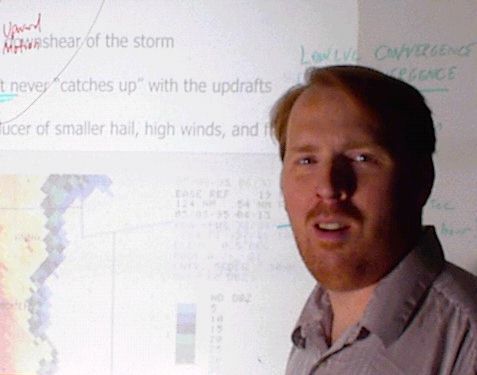 During spring months Tim sometimes operates the Chase Hotline, a pinpoint severe weather forecasting service which is responsible for delivering precision targets to chase tour operations valued at nearly $150,000, as well as ensuring consistent successes among dozens of individual storm chasers. Delivery of forecasts is typically via E-mail or fax. You can choose a one-time forecast or a scheduled forecast. We do worldwide forecasting, and our rates are competitive, flexible, and perfect for a company on a limited budget. Tim is also available for on-site training, with many satisfied clients over the years (references on request). To find out what we can do for you, contact us. We look forward to serving you. LEARN TO FORECAST! Improve your university meteorological studies with practical experience, gear up for your career in meteorology, or just check out how it's done! All users of Forecast Laboratory 2015 are entitled to receive free of charge the bonus satellite pack, which fills in hourly satellite data for almost all the case dates. This is available only via an 800 MB download from our website. To get this download, contact us. We have received several questions about running our applications under the Mac OS. All of our programs are reported to work perfectly on Mac OS X using the WinOnX emulator. User Filippos Tymvios from Cyprus reports, "The installation is very easy: you start the emulator and double click on the Digital Atmosphere .exe. The only problem was noticed when working and switching from more than 3 osx applications to DA. The emulator freezes and you have to restart it - and that's all." The WinOnX website is located at www.winonx.com.